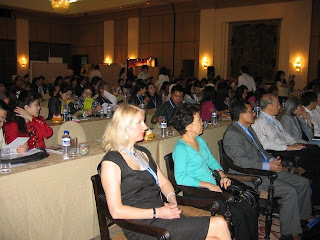 At the Grand Hyatt Nusa Dua Bali Hotel, the Asia Pacific Anti-Aging Medicine Conference opened on Friday, October 10th 2008. Up to 300 participants from various countries in the world took part in the event organized by the American Academy of Anti-Aging Medicine (A4M) / World Anti-Aging Academy of Medicine (WAAAM) supported by the European Society of Preventive Regenerative and Anti-Aging Medicine / ESAAM, FK Udayana and Indonesia Society of Anti Aging Medicine(ISAAM/PERKAPI) and CDK (media partner). Prof. Robert Goldman, chairman A4M, stated that the conference in Bali is a form of mini-level world conference in Las Vegas later. All speakers are specialists Anti-Aging Medicine level of a world that comes from Europe, Asia and North America. Bali, according to Goldman, already his second home. Consequently, although need to travel (this time) up to 35 hours, he felt pleased to meet with friends friend practitioners AAM. The next speaker, Prof. Michael Klentze, Secretary General ESAAM, praised the courage of Indonesia, especially the Udayana Medical Faculty - for the first time in the world of education-Master (S2) in the field of Anti-Aging and Regenerative Medicine. Udayana Medical Faculty had a big step this course followed by the establishment of similar programs at several universities in Europe. Indeed, in the words of welcome be earlier by Prof. Wimpie Pangkahila, as host, has stated that with the master's program that is going to the participants in each force, to prove that the Anti-Aging Medicine has been recognized in the world eksistensinya more specific in Indonesia. This is a cause PERKAPI according to Prof. Kisjanto as chief ISAAM will always encourage the opening of fields AAM study in various universities in Indonesia. In the Evening, after the conference, all participants were treated with warmth in the Victus Life. In this warm welcome party, all participants (especially the often follow the activities of anti Aging medicine), reflected a sense of satisfaction, due to the knowledge obtained truly Anti-Aging Medicine, so they can more clearly what the Anti Aging and how to run Anti-Aging Medicine practice in order to provide the best for the community / clients in their respective practices. megikuti Participants of the full event (conference and workshop) will get Indonesian Medical Association (IMA/) IDI credits up to 24 points. Workshop will be held in the next 2 days, divided into 2 tracks that run parallel. Wah Happy, nggak sempat jalan-jalan di Bali. Hari terakhir malah buru2 pulang. Serunya, kita bisa dimajukan jam keberangkatannya. Biasa.... orang-orang khan pada mau datang paling pagi dan pulang paling malam. Jadi penerbangan antara biasanya kosong-kosong. Kemungkinan itu yang bisa membuat kita diberangkatkan lebih cepat. Bayangkan, kita baru check in, sudah ada pengumuman untuk segera naik ke pesawat. Wuiii, hampir saja ketinggalan. Kalau bus khan bisa dikejar, tapi pesawat, gimana caranya kalau ketinggalan yha? All of us wish to postpone our grey days. But one day we will reach old age whether we like it or not. This can be delayed by following certain important steps regularly. I think this summit helped a lot. We may try to slow down aging by following certain behavior, lifestyle, treatment, surgery, therapy and medicine.